Humpback whales in the Turks Islands Passage. Although Grand Turk isn’t quite as great a spot for whale watching as Salt Cay is, sightings are regular in the winter months. Often a possibility on a whale watching cruise, a snorkeling encounters will be an unforgettable experience. 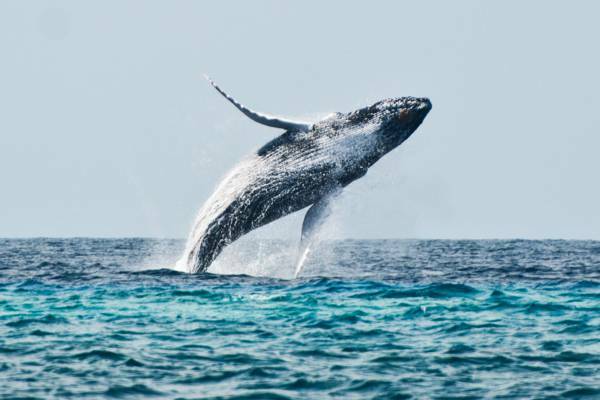 Although you might not initially expect it, Grand Turk (and the nearby island of Salt Cay) offers great humpback whale watching during the January to April winter months. Humpback whale breaching off Grand Turk. Photo by Kaieri Photography. Every year, humpback whales migrate from the northern Atlantic to the warmer northern Caribbean waters to give birth and to mate. The Turks and Caicos Islands are situated on an underwater plateau rises 11,000 feet (3,350 meters) from the surrounding ocean floor. Much of this extensive subterranean shelf is relatively shallow, but a deep channel splits this plateau and separates the Turks Islands from the Caicos Islands. 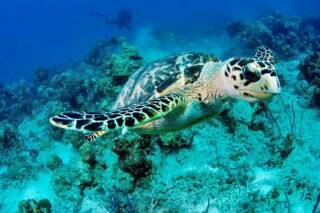 Whales are funnelled through this passage and consequently migrate quite close to Grand Turk. Quite a few local businesses offer whale watching tours. Most of these trips are afternoon excursions, but custom tours can easily be arranged. Although not guaranteed, it’s possible that you’ll get the opportunity to snorkel with the whales, and we highly recommend that you take advantage of the chance if possible. One truly impressive aspect of a snorkelling encounter with humpback whales doesn’t even sighting one of the giant marine mammals, it’s simply experiencing the deep blue ocean from under the surface. On the boat, the deep Atlantic water off of Grand Turk appears a dark navy blue, yet it takes on an incredible vibrant blue and lighter shade when underwater as the sunlight refracts and reflects. On sunny days, the effect is even greater, with distinct rays piercing the depths.